Laksa is a popular spicy noodle soup in the Peranakan cuisine. Laksa consists of rice noodles or rice vermicelli with chicken, prawn or fish, served in spicy soup; either based on rich and spicy curry coconut milk, or based on sour asam (tamarind or gelugur). It can be found in Malaysia, Singapore, Indonesia and Southern Thailand. 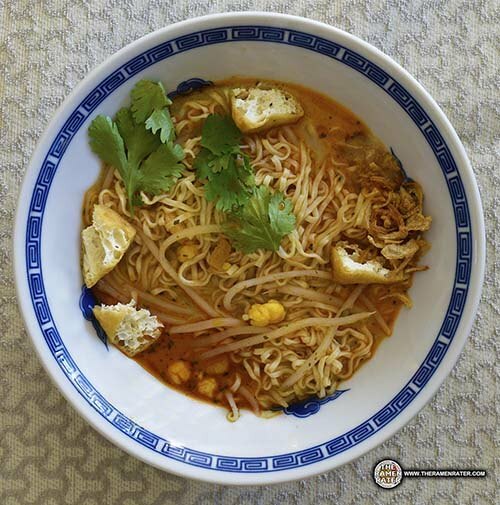 There are various theories about the origins of laksa. In Indonesia, the dish is believed to have been born from the Chinese coastal settlements and the mixing of cultures between Chinese merchants and the local cooking practices. As Peranakan Chinese communities have blended their ancestors’ culture with local culture, Peranakan communities in different places now demonstrate diversity according to the local flavour. In Malaysia, the dish is believed to have been introduced by Chinese immigrants in Malacca. 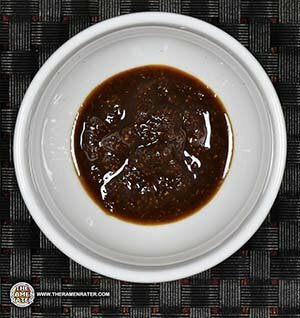 In Singapore, the dish (or its local “Katong” version) is believed to have been created after interaction between the Peranakans with the local Singaporeans. There’s a ton more info on laksa in the Wikipedia entry here. 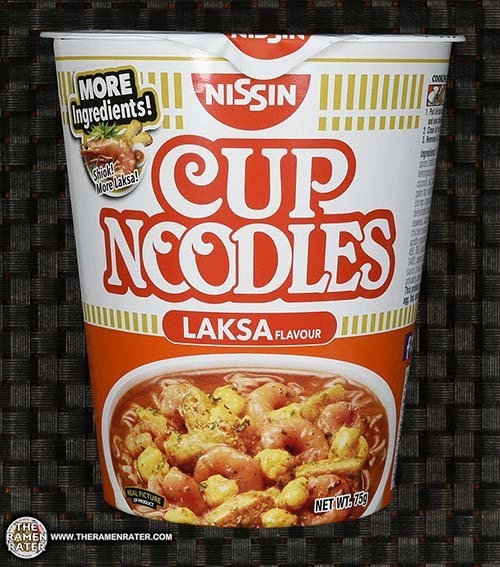 Now, let’s grab our utensils and dig into this cup with a new recipe! Detail of the side panels (click to enlarge). 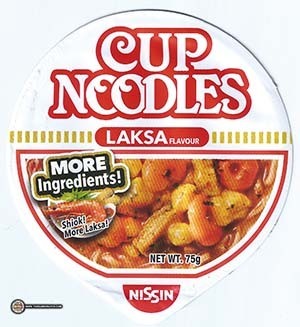 Contains shrimp. To prepare, add in sachet contents and boiling water to fill line. Cover for 3 minutes. Finally, stir and enjoy! 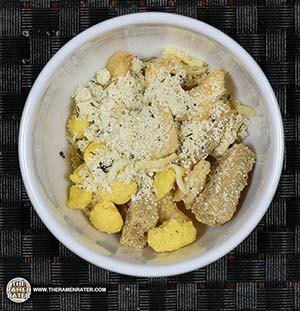 Loose ingredients and seasonings from the cup. Finished (click to enlarge). Added Coriander, Salad Cosmo mung bean sprouts, fried onion, tau pok, and chilli oil. 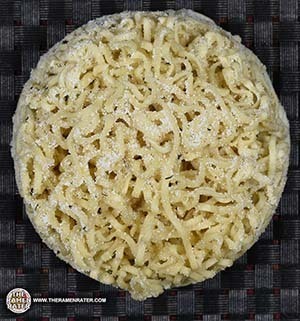 The noodles are soft and plentiful – kind of a narrow flat nature with a light mouthfeel. The broth is seething with flavor – from the spicy to the sweet and it’s nice and creamy. The included shrimp, egg and tau pok are very good. 5.0 out of 5.0 stars. EAN bar code 8888279102081. 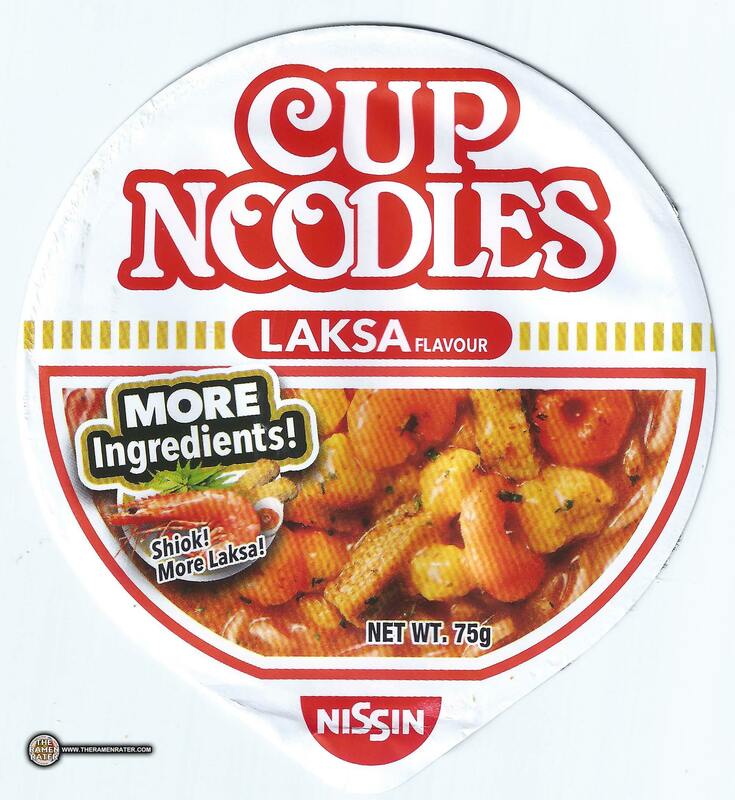 This entry was posted in * Stars 4.1 - 5.0, Nissin, Seafood, Singapore and tagged 2617, 888279102081, 8888279102081, cup, cup noodles, laksa, laksa flavour, more laksa, nissin, sg, shiok, singapore, singaporean on November 16, 2017 by Hans "The Ramen Rater" Lienesch.